Thank you to Cyclone for giving us the opportunity to test out the Spheros! Have you ever felt under pressure or that everyone is relying on you? Do we have the movie for you! Kia maia, kia manawanui, believe in yourself! This is Room 7's entry into the Manaiakalani Film Festival 2016. Check out other films from the film festival here! Today, we had a day where we busted myths! We had a lot of fun experimenting to learn about the scientific method and changes between solids, liquids, and gases. We completed a 3-way rotation. In these photos, we are exploring sublimation (changing from a solid to a gas). 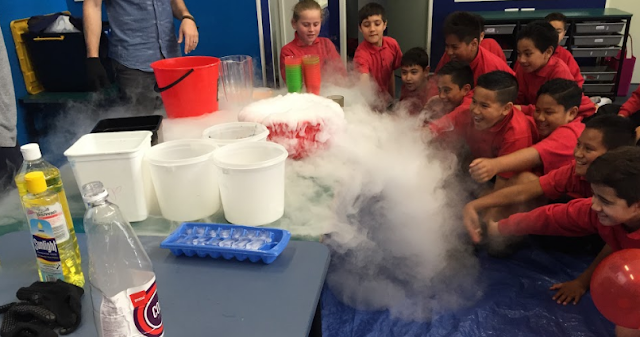 We used dry ice to show this change in state through a number of experiments. Did you know that dry ice is a solid and has a temperature of -78.5 degrees celsius? That is 78.5 degrees colder than frozen water (ice)! 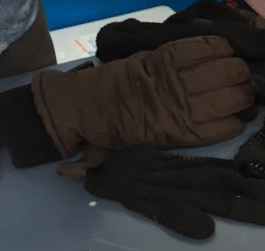 It is so cold that whoever handles the dry ice has to wear gloves to protect their hands from the cold! 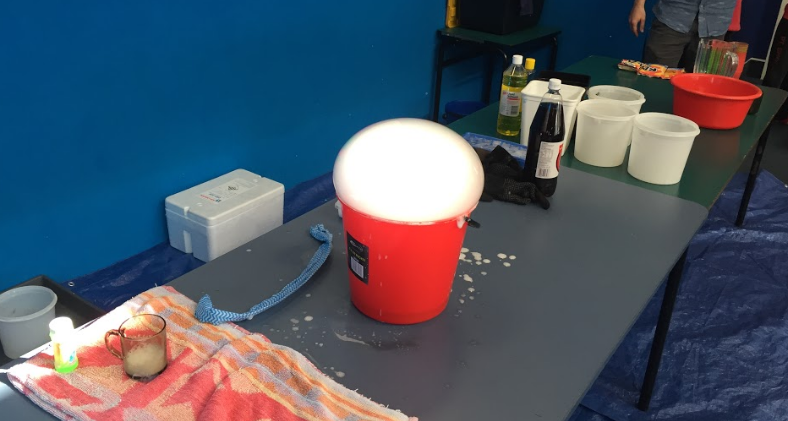 Here we showed a build up of gas as the dry ice went through sublimation by created a detergent bubble over the bucket. Here, we added dry ice to water to show the release of a gas during sublimation. 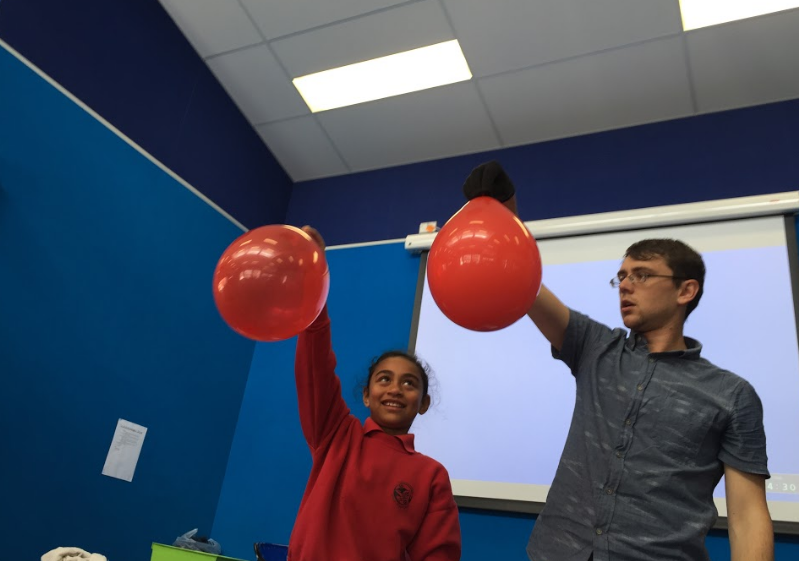 In these photos, we compared a balloon which had been blown up by using our breath (left), and a balloon which had been blown up by the gas created using dry ice (right). The balloon on the right was much heavier so it hit the ground first when dropped. You can also see that the balloon on the left is see-through where as the one on the right is not. We then explored the result of mixing detergent, warm water and dry ice. 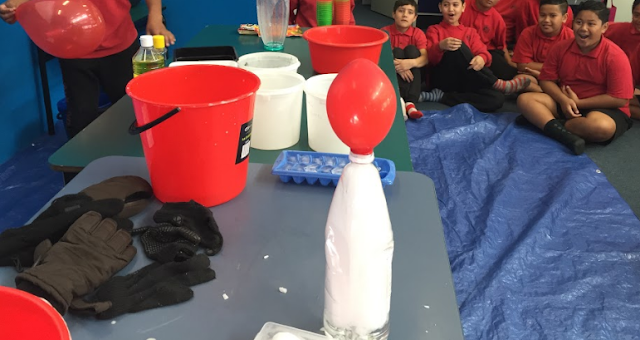 It created a foam made up of lots of bubbles which turned into a gas when popped! We finished by creating a blog post showing our learning. 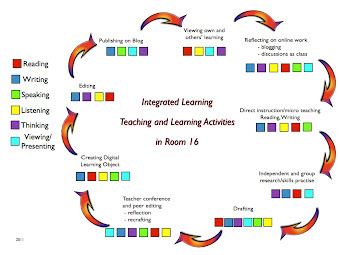 Check out Sheales' learning here! This term our inquiry is Ch..ch..ch..ch..changes - The Material World. At Immersion assembly this morning, there were experiments, cooking, and some great entertainment and movies! Stay tuned for some photos from Immersion Assembly! 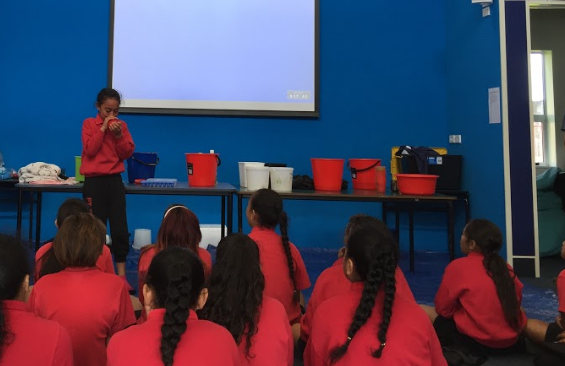 We spent the first three weeks of term 3 learning about technology at the Olympics. We found it really interesting and enjoyed discussing and sharing our ideas! Walt: locate and summarise ideas. Walt: ask questions after reading to clarify our thinking and discuss what we are still wondering. I have made a poster for Zephyr for her to improve. There is one problem in this drawing. Can you find it? 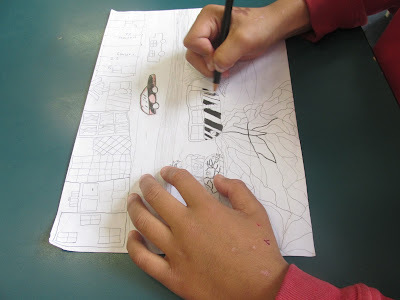 A lot of creating has been happening in Team 4 as we prepare for the art exhibition. 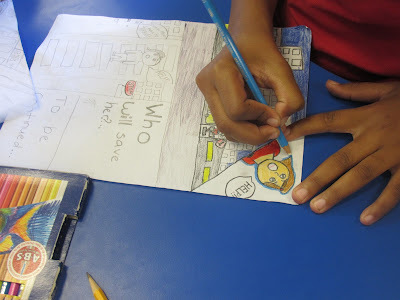 We are finishing up our plans of our comic art action scenes and moving onto our final pieces of art! Our medium is water colour pencils and fine-tipped sharpie pens. As the art exhibition is a couple of weeks off, we thought we would give you a taster of what is to come! Watch this space for our completed masterpieces! 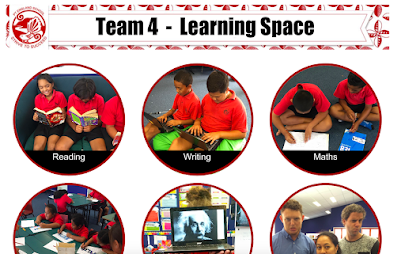 A snap shot of team 4 being engaged in learning! This term we are studying ART! 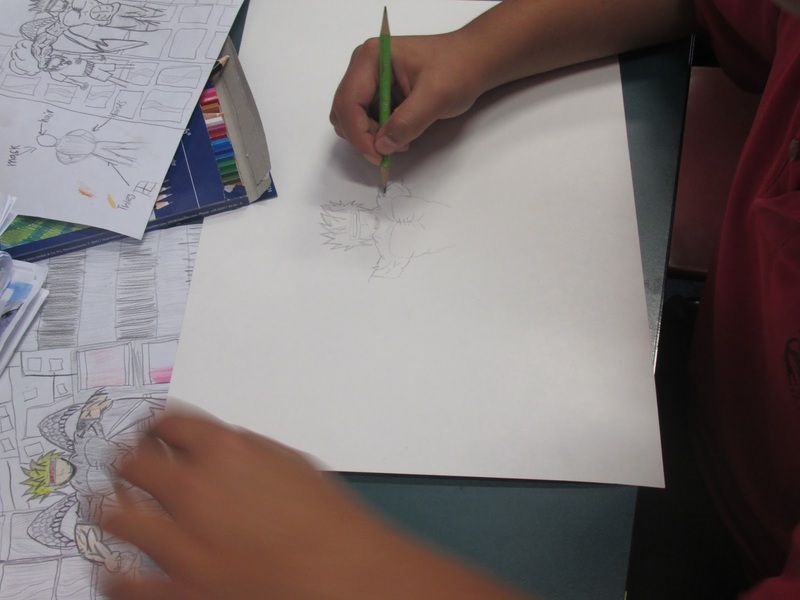 Team 4 are looking at the art work that is specifically used in the creation of comic art. We will be creating our own comic book art both digitally and on paper. 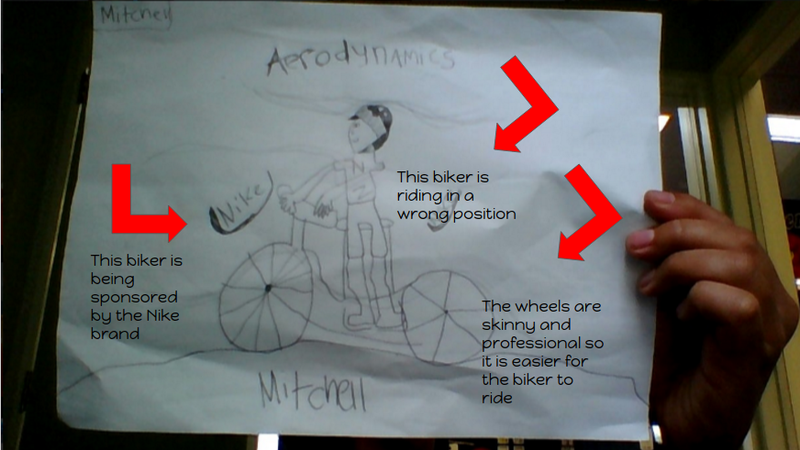 The teachers of Team 4 decided to make their own comic book using photos. Take a look and don't forget to leave a comment! WALT: We had to create a Google maps showing people 15 or more Volcanoes in New Zealand or around the World. We had to create this because this term team 4 are learning about Volcanoes. We created this on Google maps and we used pins to pin all the Volcanoes all around the world. 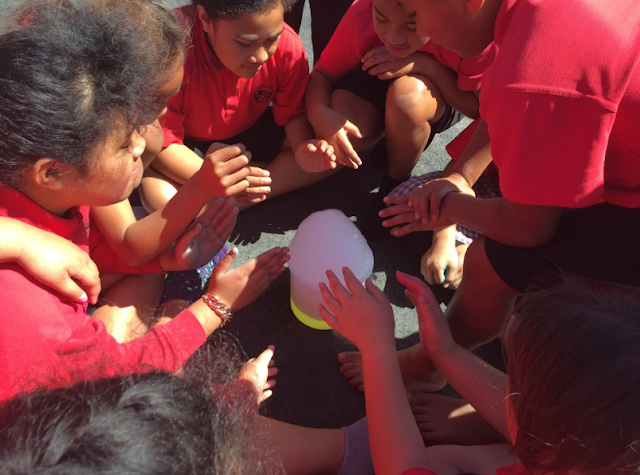 This is Room 7's entry into the Manaiakalani Fiml Festival. Have you ever wanted to become a Jedi Knight? Well now you can... with this amazing new product... THE FORCE! Students in Team 4 have been looking at video games. Rooms 6 & 7 have focussed on learning about side scroller games. Check out how we are getting on with the creation of our games! 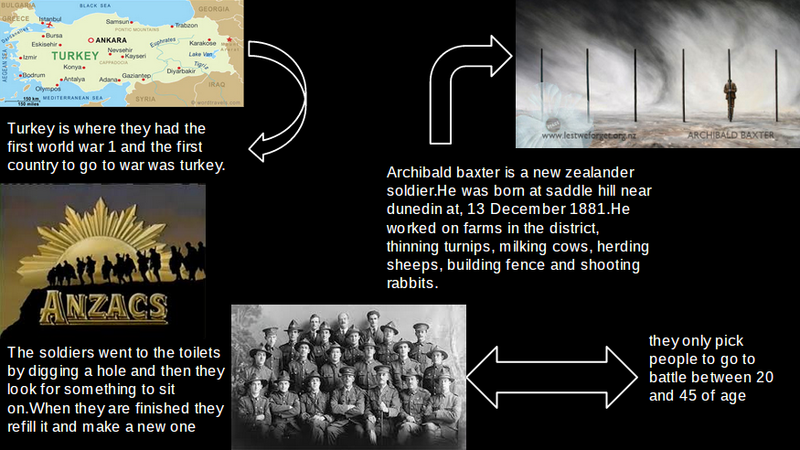 This is my ANZAC poster that I have put together with photos and information to show things about ANZAC. I have been finding out with my group Redbands about Archibald Baxter and his story, "His own war". 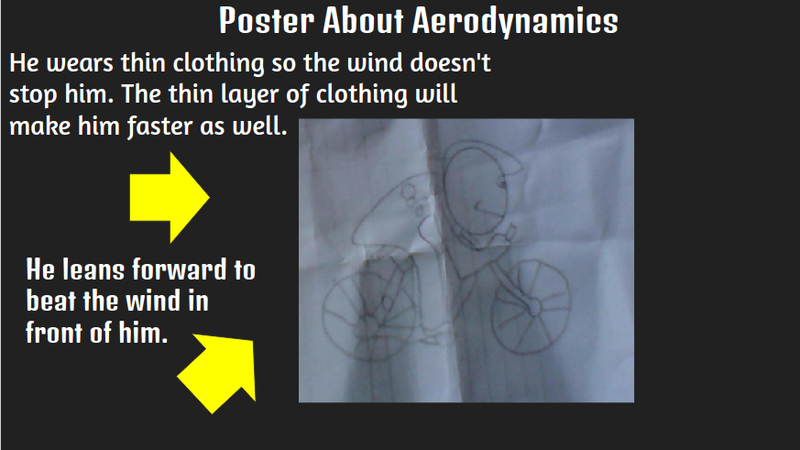 I have found out lots of things in his story and have put them on my poster for my blog. Please leave a comment. In Room 7 Literacy Class we had to try and write some information about Silas. Then we had to write out information in our own words. What I learnt is that some soldiers went to war but didn't want to fight and kill others. Silas was one of those men. 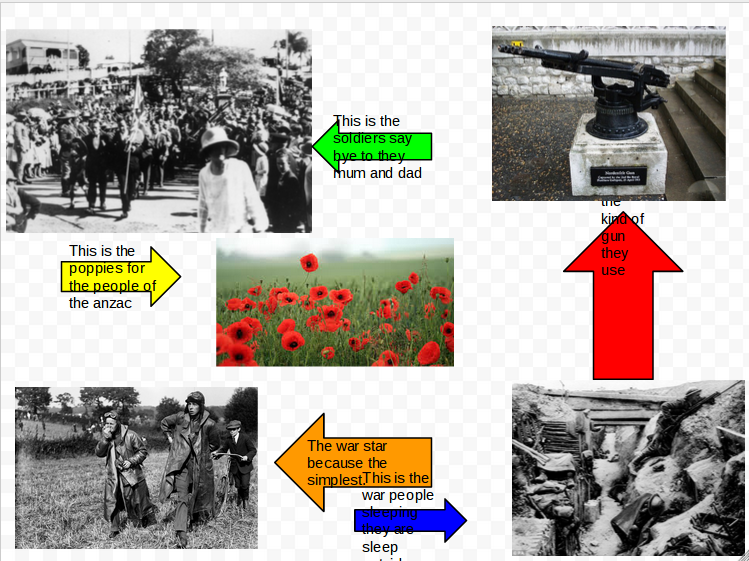 This week room seven literacy class learnt how to create a poster with information about Silas who went to war in 1914. He became a stretcher bearer. Silas got injured during the war while helping someone else, even though he had decided not to fight in the war. Hi my name is Junior and this is my post I made about World War 1. I made a post about World War 1 because I want to help others understand what happened and why we should never forget about the brave soldiers. On Friday the 25th of April we had a very special Assembly for ANZAC. Mr Burt took us out to show us our special Remembrance field to remember the soldiers who fought for our freedom. They sacrificed their lives to keep peace in this world from all the bad things that happened in world war 1. When all of the kids got to the Remembrance field we had to have a moment of silence to show respect and honour those who fought for us in the war. Then people started praying for all the luck that they have been given to us in this world. And then the trumpet started playing for a moment to finish the end of the assembly. Did you know that in World War 1 they did not only have soldiers in the army but they had different types of animals to help with things like carry ammunition, pull guns and carry wagons. Dogs were used also to help send messages, to help search for wounded soldiers and carry medicine. Dogs were a better choice to use because they were faster and more quicker than a soldier, so they would have more of a chance to survive if they had to run across the battlefield to send a message to the others. If someone got caught they would let them go because people didn't want to kill others. They would just surrender and send them back to have peace. At our Special Assembly we had some of our students and teachers wearing poppies to show the remembrance of those who had served for us. Poppies were the first flowers that blossomed in the spring during 1915 on the battlefields when the war had ended. Poppies are worn as a symbol in memory of those who had fought and died for us during the world war 1. It was the inspiration and dedication of two women who promoted this same “Memorial Flower” funds were raised to help support those in need, especially servicemen and civilians suffering from physical and mental hardship as a result of war. 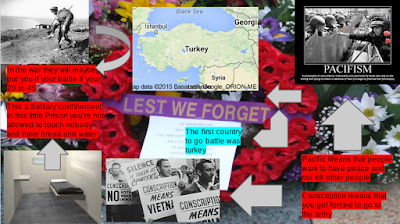 What I have learnt about ANZAC is that in New Zealand ANZAC is marked as a national public holiday, which everybody has a day off to remember those who fought for us in World War 1 . And dogs in world war one they can very help because they help the people that were wounded in World war 1 and carry things.